With its ergonomic, rubber grip and classy trim, the Allegra Metal Ballpoint Pen is a quality stylish choice for your next promotion. The elegance of the metal barrel can be enhanced with a classy gold engraving, or your logo can be pad printed according to your choice. 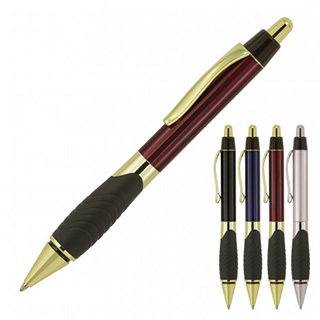 Equipment is a push button, retractable ballpoint with black ink from a Parker type refill with a 1.0mm nib.